A Vancouver woman who was visiting the west coast of Vancouver Island this week for meetings had one meeting she wasn’t expecting on Wednesday – with a wolf. Sandra Riches was waiting for a ride to pick her up and started recording cellphone video to send to her boyfriend as she walked towards the beach. She was then startled when she realized she was also recording a wolf on the beach in front of her. “I was just saying a few things to him and I saw something come out of the left hand of the screen and it caught my eye. I just stopped there for a minute and then I realized what it was," Riches said. She was in the Tofino area to attend meetings with Parks Canada staff and showed them her encounter. They confirmed it was a chance encounter with a Coastal Grey Wolf. "I met with the Parks Canada and wildlife staff and I showed them the video and they were all thrilled and excited and so happy for me. They said it’s rare and a wonderful opportunity,” Riches said. Vanessa Isnardy is the provincial coordinator for Wildsafe BC, a group that promotes positive interactions with wildlife. She said both Riches and the wolf both did the right thing when they came across each other. “The good part is that the wolf behaved as we would expect a wild wolf (to) behave. It was weary, it saw the person and as soon as it saw the person, it took off in the other direction,” Isnardy said. 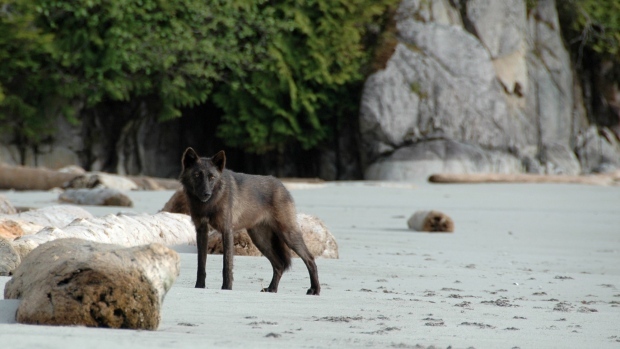 While Wednesday’s encounter occurred on Mackenzie Beach outside of Tofino, Wildsafe is using the opportunity to remind the public that encounters with wolves can happen anywhere along the west coast of the island. “There is a lot of camera work that’s been done in tracking along that area so they know that the wolves are always present in that area," said Isnardy. She also said early mornings and late evenings are when the chances of encounters increase. Riches says it’s an encounter she will always remember.